Tasty Colours: French – Thai Fusion Tart by Eric Kayser. Intellectual Masturbation. French – Thai Fusion Tart by Eric Kayser. Intellectual Masturbation. I came to Paris for a couple of weeks, but not really on holiday. But still I have some time to visit my favorite places, bakery shops, book stores and neighborhoods. One of them is the Asian quarter in the 13th arrondissement - despite the fact that it is so little French. I call it the “guts” of Paris. For those who live in huge agglomerations like London or New York City maybe it will not be impressive. But for a girl from Kraków, where the access to fresh, authentic Asian ingredients is still difficult (in particular, fresh exotic vegetables, dried seafood and fresh exotic fruits) visiting Avenue d’Ivry and its surroundings is a must. This neighborhood seems far away from France elegance. 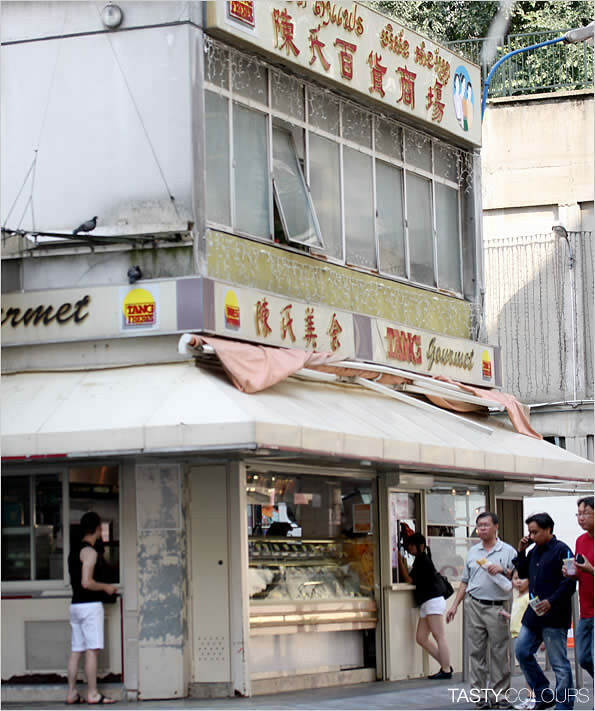 Located in the south-east of the city, tall and slim buildings resemble rather Hong-Kong residential areas built in the 50s for immigrants than chic Parisian residential houses. 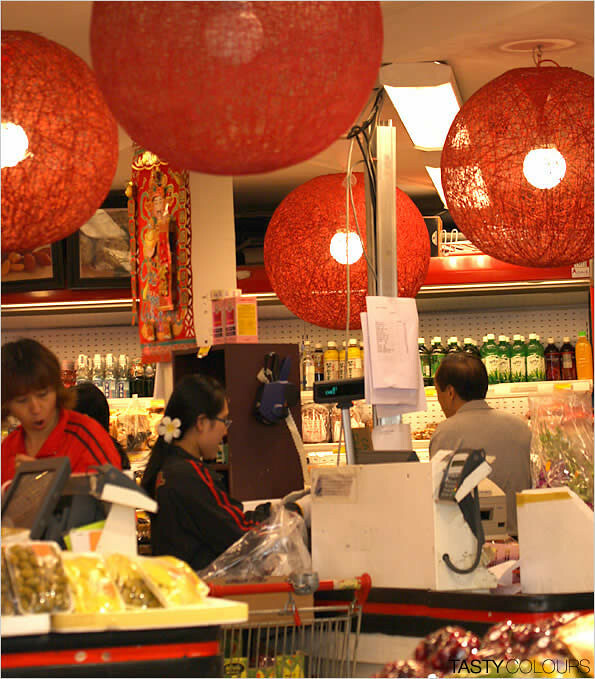 In the neighborhood (most notably, Avenue d’Ivry) one will find more grocery stores and authentic Thai, Vietnamese, Laotian, Cambodian and Chinese restaurants, where both the owners and waiters barely speak French. 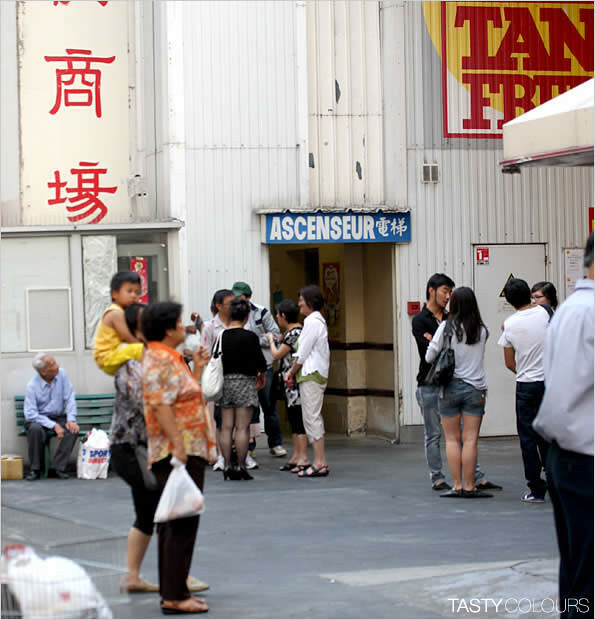 The same concerns sales persons in the Tang Frères supermarket – where none of them hardly say anything more than bonjour. However, one will not find so many Japanese and Korean restaurants (and if yes, probably they will be conducted by Vietnamese / Chinese). As I mentioned HERE, the Japanese / South Korean Community resides close to Opéra quarter, in the 1st arrondissement. Anyway, for those who love Asian cooking, visiting the Tang Frères supermarket is a must. It is not a small grocery store, but quite a spacious supermarket where durian fruits emit a rather noticeable and persistent smell. You will find everything, or nearly everything that is necessary for authentic Far East cuisine - including dried fish and seafood as well as strange vegetables, greens, and leaves – imported straight from Asia and transported by huge jumbo jets every day. It is probable the only neighbourhood in Paris where it is possible to buy green papayas and green mangos for savory salads and at the same time the ripest sweet mangos. I am always surprised by the various types of those mangos ranging from 5 to 15 Euro per kilo, imported straight from Thailand, Pakistan, India or Morocco, and also by their taste – since then I do not buy mangos elsewhere (especially not in Poland). Despite the fact that their prices raised significantly over the last 5 years, Tang Frères is still reasonably priced. My husband is an expert in French breads and he is of the opinion that the Polish do not know how to bake good ones. I am rather of the opinion that he is some kind of a nationalist attached to French breads and baguettes. Of course that baguettes taste the best in France like Polish sour rye bread tastes the best in Poland. It is like comparing Italian pizza dough and French pâte sablée or pâte brisée. Two different stories. Although, on the other hand, it is true that, in general, the quality of bread in Poland decreases. In Paris, one of our favorite bakeries, since a certain while, is Maison Eric Kayser. Eric Kayser has several locations in Paris (for example, rue du Bac in the 7th – very close to the Seine river) and abroad (but not in Poland yet). Within the next few days Eric Kayser has just opened his first shop in New York City. Eric Kayser is a baker and a French pastry chef specializing not only in breads (for example, I recommend his buckwheat bread and buckwheat baguettes). Among other Kayser’s specialties are sweet and savory tarts and quiches. One can try them in his bakery shops. 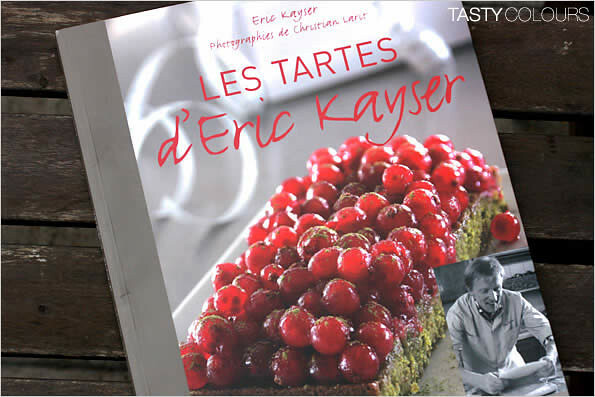 In 2006 the Flammarion Edition house published Kayser’s cook book “Les Tartes d’EricKayser” which, as many other cookbooks, remained untouched for some time on my bookshelf. This time, I took it with me to Paris. I love tarts and I am very picky about them. I have a hard time to swallow those with a hard dough, which bottom is not crispy but gluey because the “appareil” or juices soaked into it. This is exactly how usually they are made in Poland, even in restaurants. That is why I very rarely order tarts in Poland, and sorry to say that – usually I am disappointed. A good tart is not difficult to make but it requires time and patience. And as a good pizza, a good tart does not need many ingredients – usually the lesser the better. Two – three ingredients of good quality and that’s it! And most importantly the dough should be crispy. When I see so-called “French tarts” made with too many ingredients, with no common sense and no thinking – like, for example, a mixture of Italian Parmiggiano and sun dried tomatoes, French camembert, scallions, ham, carelessly chopped tomatoes and God knows what else – I am really tempted to write to the author to say: Please do not call this “tart” a French one! So, we like breads from Eric Kayser's and we love Thai food. I am not a great fan of fusion cooking and I am skeptical about cook books written by famous chefs. I am always afraid that they did not write their recipes on their own or that they did not check them in person, because simply they are too busy to do so. 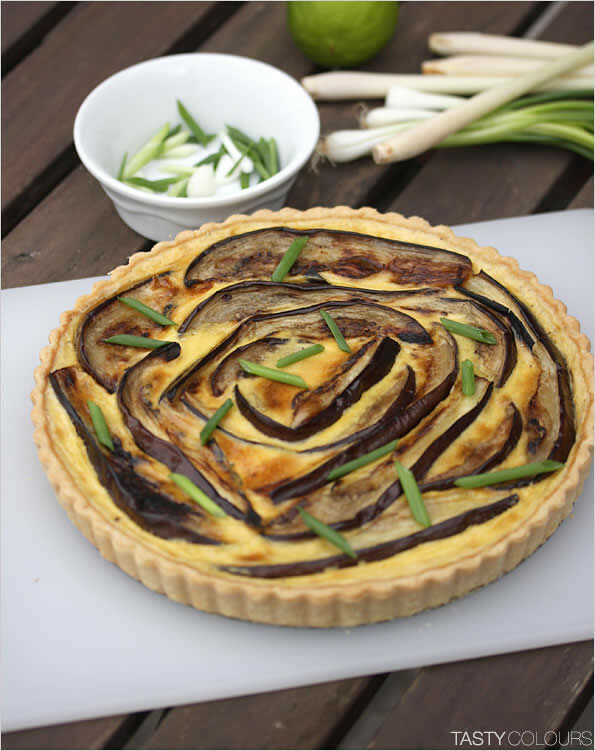 But this time I decided to make a fusion French-Thai tart with eggplant, chicken and green curry paste. And I must tell you – if I was not a tart maniac and if I did not check it out sentence by sentence, Eric Kayser"s recipe does not work out! First of all, the book does not indicate how deep the tart mold should be. The recipe calls for one square tart mold of 24 cm or a round one of 26 cm in diameter and 400 g of pâte brisée. This, in my opinion was way too much – I used around 220 grams for my tart (the rest for a second, smaller tart). Moreover, I added cold butter and I chopped it into sand and not at room temperature, as indicated in the book. I wanted my dough to be really sablée. Moreover, Eric Kayser in his book indicates to use 500 g of sliced chicken breasts – in my opinion 250 g was already enough, and 500 g simply would not fit into the mold. The next thing was the amount of eggplants - Kayser advises to use 3 of them, but unfortunately he forgets to specify whether they should be big, small or medium…all in all I used 1 large eggplant of about 300 g, cut along into thin slices. I also used a lesser amount of the batter (coconut milk and cream). In place of marinating the chicken in coconut milk overnight, as indicated in the recipe, and then put it raw in the tart shell, I decided to marinate it in a bowl with 1 smashed lemongrass, a bit of fish sauce, ginger and sunflower oil. I then sauted the small pieces of meat for 2 minutes. The result: a perfectly baked tart with a crispy and a bit spicy dough, all in all good, but my husband described the result as intellectual masturbation and I think he's got a point because tarts go best with European ingredients and green curry with Thai rice. 1. Prepare the pâte sablée incorporating green curry paste, following the directions here. The best is for the tart dough to rest in the fridge overnight. On the next day finish and prebake the tart shell as explained in the recipe for the tomato tart linked above. Before placing it in the oven, add a bit of egg white over the inside bottom of the tart shell to prevent the liquid filling from soaking it at a later stage. 2. Cut the chicken breast into small cubes (around 1 – 1,5 cm) and marinate it overnight (or for at least one hour) in a bowl with some vegetable oil, a bit of fish sauce, chopped ginger and chopped, smashed pieces of lemon grass. 3. In a bowl, mix crème fraîche with coconut milk, eggs, soya sauce, lime zest (very finely chopped) and eventually a bit of salt and pepper. Put aside into the fridge overnight or for at least one hour. 4. On the next day preheat the oven to 180-200 degrees. Slice along the eggplant into thin (around 0,5 cm) slices (if necessary, spread salt over it before and put aside for around 30 minutes; however since most of eggplants do not have any bitter aftertaste nowadays, it might not be necessary). Oil the slices evenly, place them on a baking sheet lined with aluminum foil and grill until slightly gold on both sides, but not burn. Put aside. 5. Prebake the tart dough as described in my recipe for the tomato tart. In the meantime, remove the chicken from the bowl and discard pieces of ginger and lemon grass. Heat well a wok or a frying pan and sauté the chicken for a maximum of 2 minutes. Put aside. 6. Place the chicken pieces at the bottom of the tart, pour the coconut batter into it (but not too high, because you still need to add the eggplants). At the end, place the eggplants. 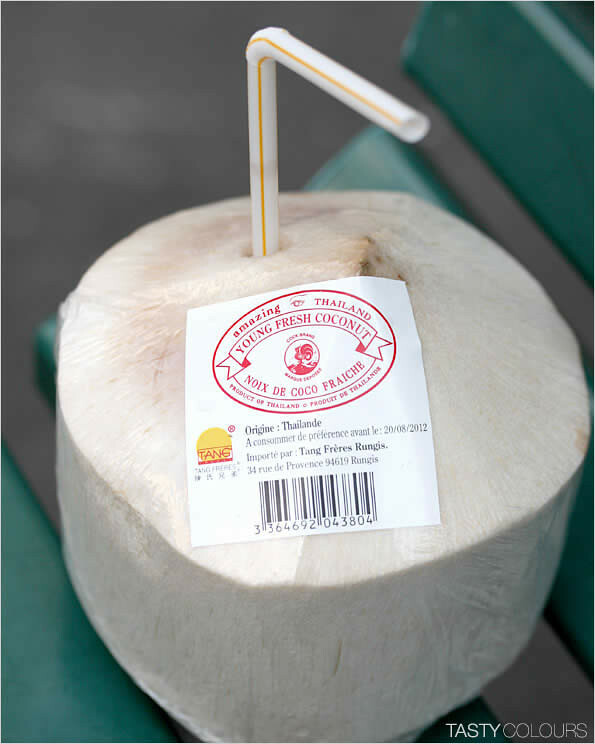 They should not soak completely into the coconut milk, so they can grill even more during baking. 7. Bake the tart at the temperature of 180 degrees Celsius for around 20-30 minutes. It really depends on the quality of your oven. The batter has to be set and golden and the dough must be gold. Serve sprinkled with some fresh herbs - Thai scallions, coriander or Thai basil. ro - I should finish this weekend, so you can read. However, I'm a little bit confused by the name you gave to your pastry. Although not being a pro, I've always thought that pate sablee is the richest of the three basic types of shortcrust pastries; with the highest butter and sugar content, and pounded almonds added sometimes, to further increase its crumbliness. Your (or should I say, Kayser's) recipe for the pastry looks rather like ordinary (if one disregards lack of eggs) brisee than sablee. But I could be wrong, as you never know these days, especially if you're stuck on the outskirts of civilised world and having to rely on re-runs of TV culinary shows, as I am. As far as quantities of dough used are concerned, it also depends on how thin you roll your pastry. I found that brisee, having less gluten breakers (shortening and sugar) than sablee, is tougher of the two and hence can be rolled to almost transparency, especially when cooled to optimum temperature. Sablees are much more brittle to work with and if too thin, they are susceptible to overbrowning in the oven. I will always use up more sablee or sucree dough than expected when lining my tins, and less when I do the same with pate brisee. Mushroom Barlotto - Pearl Barley "Risotto"
Vegetable Stew with Baby “Jaś Karłowy” Runner Beans. Goose Season. Warm Salad with Smoked Goose Breast, Chanterelles and Pumpkin.